Have you got Google Earth on your computer? If so, then download the Google Earth Map of Alfresco. Is this the wrong position for Alfresco? If you think so, then modify its position. 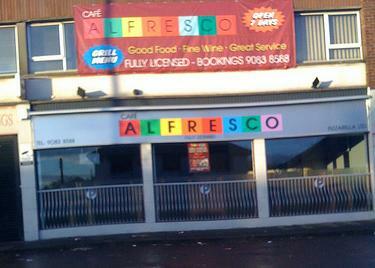 Me and my girlfriend have eaten here several times, and also at the Al Fresco's in the Abbey Centre, Newtownabbey. The food is really delicious and very well-presented. I religiously get chicken goujons, with garlic dip and sweet chilli potatoes!!! :D and the girlfriend always gets chicken goujons with chilli dip and garlic potatoes!! BOTH FOR ABOUT ?6 EACH, FOR A FULL PLATE!! DIFFICULT TO FINISH!!! REALLY NICE!! I WOULD RECOMMEND!! !